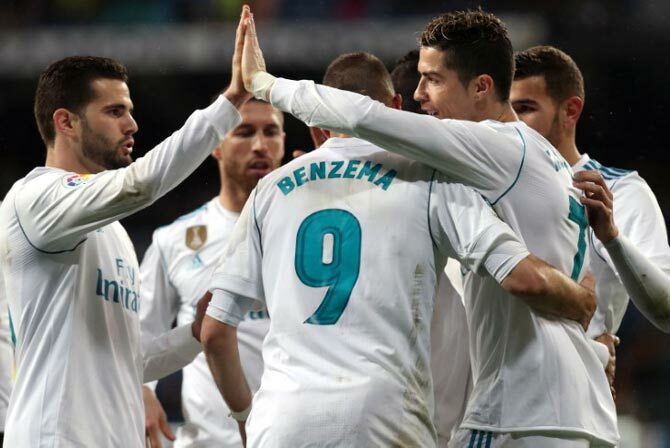 La Liga champions Real Madrid beat Getafe 3-1 on Saturday with a goal from Gareth Bale and two strikes from Cristiano Ronaldo to go 12 points behind leaders Barcelona and warm up for next week's Champions League game at Paris St Germain. Bale lashed in the opener in the 24th minute from inside the area at a sparsely attended Santiago Bernabeu, while Ronaldo stretched Zinedine Zidane's side's advantage in injury time of the first half after a through ball from Karim Benzema, scoring his 300th Liga goal. The Portuguese moved on to 16 league goals for the season by heading in a cross from Marcelo in the 78th minute to restore Real's two-goal cushion after Francisco Portillo had pulled back a goal from the penalty spot for Getafe. Former Chelsea forward Loic Remy was sent off for Getafe two minutes into the second half for a second yellow card after striking Real defender Nacho Fernandez in the face. Bale overtook David Beckham as the British player with the most appearances in La Liga by playing his 117th game for Real but missed a clear chance in injury time after being played in by a stunning pass by Marco Asensio. Real are third in the Liga standings on 54 points after 27 games. Barcelona, who have 66, host second-placed Atletico Madrid in a top-of-the-table clash on Sunday, when Diego Simeone's side can reduce the gap behind the leaders to two points with a victory. After Real's five-game winning streak in all competitions was snapped by a surprise defeat at Espanyol on Tuesday, the coach said it was vital his side returned to winning ways ahead of their trip to Paris for the second leg of their last-16 tie. "We had the PSG game in our heads and perhaps that's why we eased up a bit in the second half and had a few difficulties but once they went down to 10 men it was easier for us," Zidane told reporters. "With a game like Tuesday's coming up it was very important to be in a good mood for the next three days as when you lose you're in a bad way, so it was very important for us to win." Sevilla secured a second straight victory by seeing off Athletic Bilbao 2-0 at home to tighten their hold on fifth place, moving four points ahead of Villarreal, who were beaten 2-0 at home by Girona. Top flight debutants Girona moved up to seventh in the standings and in to the Europa League qualification spots as well as becoming the first team in their maiden season in La Liga to reach 40 points after 27 games. Basement side Malaga suffered a sixth consecutive defeat by losing 2-0 at Leganes while Deportivo La Coruna scored their first goal in their fifth game under coach Clarence Seedorf but could only draw 1-1 at home to Eibar and remain 19th. 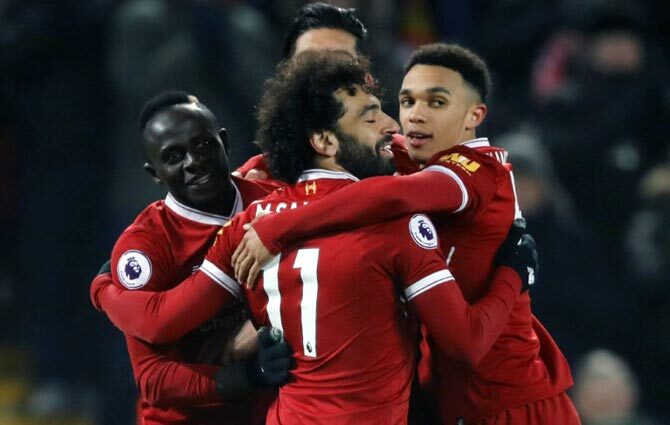 Liverpool moved into second place in the Premier League as Egyptian international Mohamed Salah continued his remarkable scoring run in a 2-0 victory at home to Newcastle United on Saturday. Salah scored for the seventh match running, taking his Liverpool total for the season to 32, when he put the home side ahead after 40 minutes. Sadio Mane's goal in the second half ensured there was no joy for Newcastle manager Rafa Benitez, whose Liverpool team won the Champions League in 2005. Manchester United will start next Saturday's game at home to the Merseysiders back in second place if they win at Crystal Palace on Monday. "I thought the boys did brilliantly," said manager Juergen Klopp. "Two wonderful goals and a few more possible. I'm happy." Tottenham Hotspur, apparently affected early in the season by playing home games at Wembley, achieved a sixth straight win there by beating Huddersfield Town 2-0 with a double by Son Heung-min. It was their 17th game unbeaten in all competitions and briefly moved them ahead of Liverpool. "We feel comfortable at Wembley, we enjoy playing here," Son said after scoring four times this week at the national stadium where Tottenham are playing while they build a new home ground. Spurs, who did not win in their first three league games there, are fourth, a point behind United and five ahead of fifth-placed Chelsea, who visit runaway leaders Manchester City on Sunday. Defeat pushed Huddersfield right back into the relegation mix, only three points above the bottom three, after winning their two previous games. Swansea City were the big winners at the bottom, moving above five teams to 13th, including West Ham United who they beat 4-1. Ki Sung-yeung scored the first after nine minutes and the unmarked Mike van der Hoorn added a second in the 32nd. Andy King's goal and Jordan Ayew's penalty ensured victory before a consolation by Michail Antonio. West Ham manager David Moyes, whose team travelled seven hours by coach to reach Swansea from London on Friday after their flight was cancelled, was bitterly disappointed with the performance, one of their worst since he took over in November. "I'm embarrassed," he told reporters. "We played so bad. I couldn't assess it, it was that poor. The fans travelled through the snow to get here and we let them down badly. That was the poorest performance since I came here." Victory continued Swansea's improved form under Portuguese manager Carlos Carvalhal. Since he joined the club at the end of December with Swansea bottom, they have won five league games and lost only two. In contrast, West Bromwich Albion's change of manager in the same month has not paid off. Alan Pardew's job appears to be under greater threat than ever after a 1-0 defeat at Watford. Albion have now won one of 15 league games since Pardew took over at the start of December and are seven points adrift at the bottom of the table. Watford captain Troy Deeney was sent clear by Will Hughes to score the only goal. Serie A leaders Napoli's title hopes suffered a setback when they collapsed to a 4-2 defeat at home to AS Roma on Saturday, while Paulo Dybala scored from a seemingly hopeless position in stoppage time to give rivals Juventus a 1-0 win at Lazio. 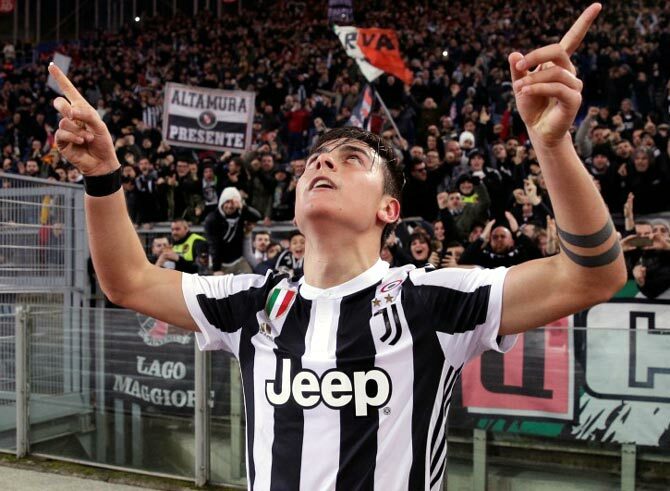 Dybala's goal gave Juve their 10th successive league win, while Napoli saw their own 10-match winning run in Serie A ended by two goals from Edin Dzeko and one apiece from Cengiz Under and Diego Perotti. Napoli, beaten for only the second time this season in the league, lead with 69 points from 27 games but Juve are only one behind and, crucially, have a game in hand at home to Atalanta on March 14, the fixture having been snowed off last Sunday. Roma were helped by another outstanding performance from Brazil goalkeeper Alisson who made a series of saves at important moments with Lorenzo Insigne his chief victim. Napoli, playing after the Juventus game had finished, got off to a flying start when Insigne put them ahead after six minutes but Under levelled one minute later with a deflected shot which flew over Pepe Reina. Dzeko put Roma ahead with a looping header from Alessandro Florenzi's cross in the 26th minute and the Bosnia forward added the third in the 73rd minute when he cut inside his marker and curled a shot beyond Reina's reach. In doing so, he become the first player to score at least 50 goals in three of the top-five leagues in Europe -- 66 in the Bundesliga, 50 in the Premier League and 50 in Serie A. It became a rout when Perotti fired home six minutes later, taking full advantage of a poor clearance by Mario Rui, although Dries Mertens made the score more respectable in stoppage time, finding the net with a low drive from outside the area. Lazio had the better of their game against Juventus until the titleholders, in typical style, snatched all three points at the death with their third shot on target. Surrounded by three defenders, Dybala collected the ball outside the Lazio area with his back to goal, turned and flicked the ball through an opponent's legs, fell under a challenge from another and still managed to fire past Thomas Strakosha from on the ground. Juve kept a clean sheet for the seventh consecutive time in the league and the only team to have scored against them in any competition this year are Tottenham Hotspur, who host the Turin side on Wednesday in the second leg of their Champions League last-16 tie. "A draw would also have been fair but these are three very important points," said Juventus coach Massimiliano Allegri. The defeat completed a tough week for Lazio who lost their Coppa Italia semi-final on penalties to AC Milan on Wednesday. "That's football, there were 20 seconds to go," said Lazio coach Simone Inzaghi. "We played well, we conceded nothing to Juve and we are disappointed at the way it finished." The Bundesliga race for berths in the Champions League remained tightly bunched after Schalke 04, Eintracht Frankfurt and Bayer Leverkusen all won while Borussia Dortmund were held 1-1 at RB Leipzig on Saturday. Schalke 04 beat Hertha Berlin 1-0 with a Marko Pjaca goal to remain in second place on 43 points from 25 matches, one point ahead of Dortmund and fourth-placed Eintracht, who won 1-0 at home to Hanover 96, with Leverkusen, 2-1 winners at VfL Wolfsburg, on 41. Runaway leaders Bayern Munich, who have 60 points with 10 matches to go, play at Freiburg on Sunday. 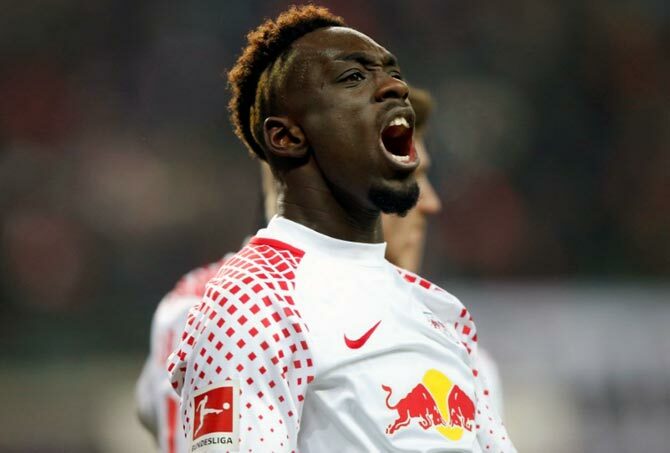 Jean-Kevin Augustin put sixth-placed Leipzig (39 points) ahead when he got behind the defence to turn Naby Keita’s pass beyond keeper Roman Buerki in the 29th minute. Marco Reus equalised brilliantly nine minutes later, running on to a superb through ball from Mahmoud Dahoud, rounding Peter Gulacsi and scoring left-footed from a tight angle. Schalke scored the only goal in the 37th minute of their home match when Franco Di Santo laid the ball off for Pjaca, who is on loan from Juventus, to fire past Rune Jarstein. "It was hugely important to play with brains today,” said Schalke coach Domenico Tedesco. “We did that in the first half, but then we were poor after the break. We have to learn from that. “We're pleased with the result, but Hertha could've had something from this game. We have a lot of work to do." At Wolfsburg, Leverkusen went in front with a penalty converted by striker Lucas Alario after half an hour following Maximilian Arnold's foul on Kai Havertz. Substitute Julian Brandt added a brilliant dinked goal in the 78th but Leverkusen’s two goal advantage lasted only a minute before Admir Mehmedi’s curling shot for the home side, whose Brazilian defender William was sent off in the 90th. "I’m extremely happy that we’ve won here because this was the right answer after last week’s defeat against Schalke," Leverkusen coach Heiko Herrlich said. When Mickelson dismissed Shubhankar as member of the media!